How many grandchildren is typical for Amish grandparents? How are older Amish people included in the community? Among the Amish age is respected, and the aged are revered voices in the community. Older members provide farming advice, wise counsel when needed, and often a connection to more conservative practices of the past. 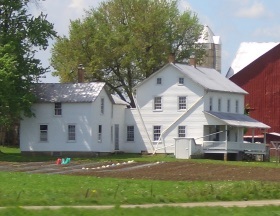 Amish youth and other members of the community may visit and sing for the elderly in their congregations. In nearly all cases the aged are taken care of by their families when necessary. Many stay active into later years. What is a dawdihaus? This is the PA Dutch dialect name given to the smaller house which grandparents live in, often attached to a main farmhouse. When do Amish “retire”? With a robust work ethic in the DNA, it is difficult to think of the Amish as “retiring”. Retiring may simply mean a change of occupation for one which is physically less demanding. For example, dairy farmers often retire in their 50s, passing the operation on to a son. They may continue helping on the farm, or take up a job in woodworking, manufacturing, or another industry. Do elderly or incapacitated Amish people go to retirement or care homes? This may happen, but is rare. As a rule Amish take care of both their aged members as well as those with physical or mental handicaps. Do Amish accept Social Security payments? Amish generally do not contribute to, nor receive Social Security benefits. Amish build their own savings for retirement years, and in worst-case situations will always be cared for by family and community members. How many grandchildren do Amish grandparents have? Many more than your average non-Amish family. With six to eight children being typical for an Amish family, it’s easy to see that grandchildren, and even great-grandchildren, can reach double digits and sometimes beyond. Some Amish have even had over 500 great-grandchildren. Ferrara, Peter J. “Social Security and Taxes”. The Amish and the State. 2nd ed. Ed. Donald Kraybill. Baltimore, MD: Johns Hopkins University Press, 2003. To Cite this Page: Wesner, Erik J. “Old Age.” Amish America. Erik Wesner, . 2015. Web. [Date Accessed]. <http://amishamerica.com/old-age/>. Image credits: elderly couple- Ed C.